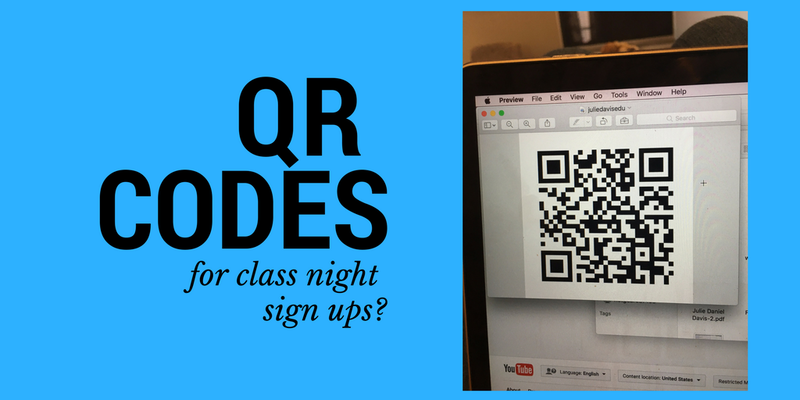 Thoughts On All Things EduTechie Oriented: QR Codes for Class Night Sign Ups? 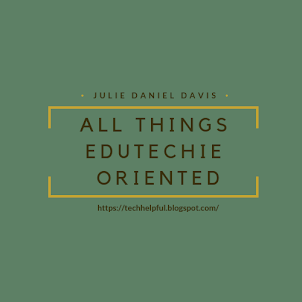 One of the things I'm quickly learning as an instructional technologist is that teaching parents how to use technology you are using in the classroom eases their mind a bit and gives them a sense of understanding. In our elementary school we use QR codes quite a bit to help students easily access information, websites, and videos as part of their learning and sharing. Teacher introductions. Create a quick video of yourself with fun facts about you and post it outside your classroom door. Instructions. 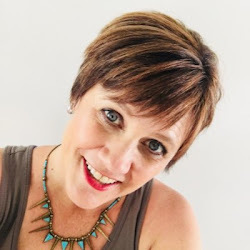 Busy teaching a small group in a rotation? Create a QR code for the other groups so the students can hear you giving them instructions for each rotation when they get there. Weekly updates. 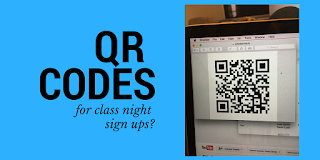 Create QR codes that are dynamic (can change to a new place) and do your weekly reminders and updates. Student sharing. Have students create QR codes to link to something they have created regarding their learning and post them outside in your hallway as a gallery of learning. At the front door. Create a QR code that tells visitors where they are and what the process is for entering and visiting at the school. At various places on campus. New cool building or football stadium? Create a QR code for telling others about the pride you have in these things and how it will be used for the betterment of your students. Both home team and visitors will be able to learn more about your school. Sports teams. Put a dynamic QR code on your school t-shirts that links to your roster and season stats. Great ideas! I will definitely share with my folks. such an ideal piece of blog.it's quite interesting to read content like this.